1 Is watermelon fattening or bad for weight loss? 1.3 Is watermelon good for slimming? 2.1 Does watermelon have many calories? 2.2 Does watermelon have a lot of sugar? 2.3 Why does watermelon seem to have a lot of sugar? 2.4 Is watermelon recommended for weight loss? 2.5 How much watermelon can you eat? 2.7 Is watermelon suitable for ketogenic diets? Is watermelon fattening or bad for weight loss? It is summer and it is hot, very hot. You want something refreshing, sweet and, if possible, natural. 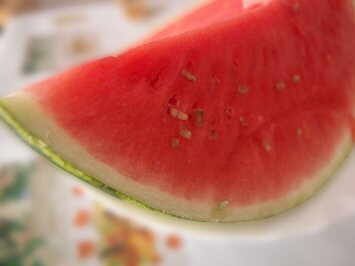 It is time for watermelons, and a perfect time to eat this appetizing fruit, if it can be, very fresh. Despite being a natural and beneficial food, watermelon is always the victim of numerous myths: Is it good for losing weight, or contains too much sugar and it is better not to abuse it? Is watermelon good for slimming? There is no reason to stop consuming watermelon if you are following a weight loss plan. Does watermelon have many calories? Watermelon has so much water that, by dissolution, it has few calories, few minerals few vitamins (except vitamin A as carotene).. Approximately 1 serving of watermelon has 60 – 90 calories (kcal), depending on the variety. That’s the same as a kiwi. What stands out most nutritionally from watermelons is its extremely high antioxidant content (lycopene and carotene). It is, therefore, an essentially hydrating, satiating and healthy food. Does watermelon have a lot of sugar? Watermelon is not a fruit with much sugar, it contains approximately 7 gr of sugar per 100g. A generous cut of watermelon has 10gr of sugar and about 60 kcal. To make a comparison, a 150 g serving of blueberries (which are one of the fruits with fewer carbohydrates) would have 6g of sugar. Instead, a large piece of apples or oranges (about 150-200g) have between 15 and 18gr of sugar. In addition to its nutritional value, it is very important not to equate the fruit sugar with the products with added sugars. Ultraprocessed with added sugars have an addictive power that fruits lack (they are hyperpalatable), and they have no nutritional value. Why does watermelon seem to have a lot of sugar? Despite having a similar sugar content, watermelon looks much sweeter than other fruits, such as apples or pears. This is because watermelon is a fruit rich in fructose, which is a type of sugar that has a high sweetening power. With less quantity, fructose provides more sweetness than sugar. About fructose, it is a healthy sugar when we consume it in the form of natural foods, although it is true that there are pure fructose sweeteners that are not recommended at all (more information). Is watermelon recommended for weight loss? Yes, watermelon is a suitable food to lose weight. In general, fruits have a composition in sugars very similar, only vary a few grams between the different types. What also have in common all fruits, such as watermelon, is its high fiber content and antioxidants, which makes them highly recommended foods for weight loss. Its components help improve circulation, lower cholesterol, and prevent constipation. Of course, watermelon is only healthy to lose weight if consumed in proper rations, without sweetening, without shaking or grinding (not juices or smoothies) and along with a healthy diet to lose weight. How much watermelon can you eat? The amount of watermelon that can be eaten normally corresponds to 1 or 2 pieces. It is not recommended to combine watermelon with foods that contain carbohydrates that are quickly assimilated, such as cookies, flour, bread, smoothies, yogurts, jams, honey, or any product with sugars or flours, which is not healthy. 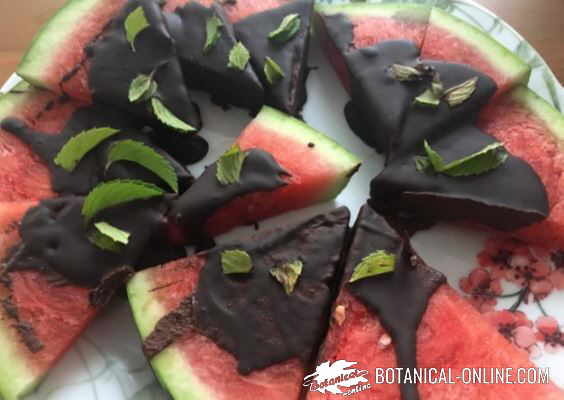 Is watermelon suitable for ketogenic diets? There are certain types of diets, called ketogenic, in which the contribution of carbohydrates in the diet is reduced. These serve both for weight loss and for treating some diseases. In these cases, when following a ketogenic diet, watermelon (and other fruits) would be a food to restrict or control its consumption. It should be mentioned that these types of diets are not low-calorie, but, in addition to reducing carbohydrate-rich foods (rice, potatoes, etc. ), increased consumption of healthy fats and protein-rich foods (nuts, virgin oil, fatty fish, etc.). In addition, a ketogenic diet should only be performed under the advice and supervision of a healthcare professional. Except for this exception, eliminating fruits from the diet is usually not beneficial.